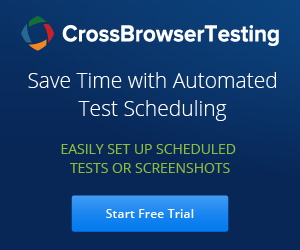 In this article, will talk about CrossBrowserTesting which lets us to test website across 1500+ browsers - Android devices, iPhones, iPads, Windows, & OSX. Check list of Operating systems, mobile devices and browsers supported by CrossBrowsersTesting. In the previous article, we have seen launching Firefox browser with Gecko driver using Selenium 3. Now let us try to launch Microsoft Edge browse using Selenium 3. Before proceeding, to start using Webdriver with Microsoft Edge browser, make sure you have Windows 10 on your machine and download the specified Microsoft WebDriver server version for your build. In previous article we have seen configuring selenium grid and execute a simple test on firefox browser. In this tutorial we will see 'Parallel execution of tests' using selenium grid and execute tests on firefox and chrome browser. We will register multiple nodes to the Hub and execute tests in parallel. In the below example we will register a node in the same local machine where hub is running and other node in remote machine. Selenium Grid allows us to execute our tests in multiple machines (physical / virtual) and multiple browsers with different versions, which dramatically speeds up test execution and helps in reducing total amount of time required for test execution. For example, if we have a script that takes 100 minutes to execute sequentially , we could break that down to 10 short tests script run across 10 machines, and can complete them in 10 minutes without copying your test code to the other machine. Webdriver events are helpful to view the events triggered by webdriver. It also plays an important role in analyzing results and helps us in debugging issues if we encounter any. Selenium webdriver has ability to track different events such as 'beforeNavigateTo' , 'afterNavigateTo' , 'beforeClickOn' , 'afterClickOn', 'onException' and so on. When ever we develop test scripts we can write our own implementation for handling events during the execution.